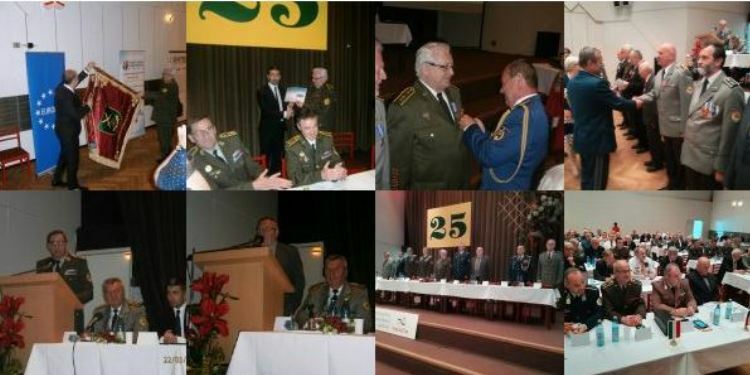 The Festive Meeting of the 25th Anniversary of creating ZV SR (the Association of the Professional Soldiers and the Military Retirees of the Slovak Republic) was held on 22 May 2018 in Military Garrison Club of the Armed Forces of the Slovak Republic in Trenčín. Almost one hundred members of the association and national and international guests participated at this meeting, including the representatives of EUROMIL from Brussels and the partner military associations of the Visegrad Group countries, Ministry of Defense of the Slovak Republic, Armed Forces of the Slovak Republic. Special guests of the celebration, ceremony and meeting were: on behalf of EUROMIL, its President Emmanuel Jacob, from Ministry of Defense of the Slovak Republic – the General Director of the Department of the Human Resources Col. Gst. Radoslav Ivančík, on behalf of the Armed Forces of the Slovak Republic – the Commander of the Land Forces of the Armed Forces of the Slovak Republic Maj Gen Jindřich Joch, from Trenčiansky Autonomous Region- the Chief of the Office of the Chairman of Trenčiansky Autonomous Region Marek Briestenský, the Mayor of the town of Trenčín Richard Rybníček, in name of the partner military association from the Czech Republic – SVP, Col. (Ret.) Jaroslav Kalivoda, in name of HOSZ from Hungary its Chairman Col. János Czövek an Maj. István Bácskai, the Slovak Union of Anti – Fascist Fighters was represented by its Chairman Pavol Sečkár, Ján Tatara – the Chairman of the Association of General Milan Rastislav Štefánik, the President of the Association of Retired Policemen of the Slovak Republic JUDr. Histo Gluško, on behalf of the Club of Generals its Chairman Maj Gen. (Ret.) František Blanárik with some of its members as Lt. Gen. (Ret.) Pavel Honzek, Col. Gen. (Ret.) Jozef Tuchyňa. President of ZV SR, Lt. Col. (Ret.) Eugen Bitera in his speech informed about history of the Slovak association ZV (A) SR and ZV SR, expressed thanks to his previous leaders of ZV SR and to the founder members of the association for their effort and work. He said: “Presidents of ZV SR, chairmen of the clubs in the structure of the association, the founder members of the association could evaluate in a best way fulfilling of particular goals and tasks in the period from establishing the association till today”. Among other things, Lt. Col. (Ret.) Bitera highlighted and specially emphasized cooperation with Ministry of Defense of the Slovak Republic, the Armed Forces of the Slovak Republic, Trenčiansky Autonomous Region, the Slovak Union of Anti – Fascist Fighters, the Association of General Milan Rastislav Štefánik, the Town of Trenčín, the Association of Retired Policemen of the Slovak Republic, the Club of Generals of the Slovak Republic, and the Hotels, Recreation and Healthy Facilities of MOD SR (HOREZZA). He highly appreciated regularly organized activity – the International Military Climbing to Kriváň Peak in the High Tatras at the opportunity of the Slovak National Uprising and the Constitution Day of the Slovak Republic. He mentioned with honor an existence of the website of ZV SR, that was currently modernized and its content was markedly changed with growing numbers of visitors. The president of ZV SR emphasized: “It is necessary to say, that this website introduces a modern platform of communication and promotion of various activities of the association”. President focused in his speech on the forms of solving problems during the previous period after changing the structure of the association concerning organizing and managing and also gaining more financial resources for activities of the association and clubs. After that, the other special guests took the floor with their speeches: General Director of the Department of the Human Resources of the Ministry of Defense of the Slovak Republic Col. Gst. Radoslav Ivančík, the Commander of the Land Forces of the Armed Forces of the Slovak Republic Maj Gen Jindřich Joch, the Chief of the Office of the Chairman of Trenčiansky Autonomous Region Marek Briestenský, the Deputy Chairman of the military association SVP of the Czech Republic Col. (Ret.) Jaroslav Kalivoda, the Chairman of HOSZ Hungary Col. János Czövek an Maj. István Bácskai, the Chairman of the Slovak Union of Anti – Fascist Fighters Pavol Sečkár, the Deputy Chairman of the Club of Military Paratroopers František Glattera, the first Chairman of ZV SR Col. Gst. (Ret.) Ján Hadač and last but not least Col. Gen. (Ret.) Jozef Tuchyňa as a constituent member of the association. All special guests thanked for the invitation to the meeting, expressed support to ZV SR and willingness to the future development and mutual cooperation. The honesty of the said words were confirmed by gifts for the association at the opportunity of the celebration. The Chief of the Office of the Chairman of Trenčiansky Autonomous Region, Marek Briestenský, handed over in the hands of the President of ZV SR one – thousand Euro cheque for activities of the association. Alike, the Mayor of the town of Trenčín Richard Rybníček, as a declaration of respect to soldiers and their close connection with the town of Trenčín decorated the Guidon of ZV SR with honorary ribbon of the Mayor of Trenčín. At the opportunity of the 25th Anniversary of formation of the Slovak Republic there were awarded by decorations well – deserved members of ZV SR by Minister of Defense Peter Gajdoš (Lt. Gen. Ret.) Commemorative medal of the Minister of Defence, 2nd grade – silver to Lt. Col. MUDr. Miroslav Malay, PhD. and Commemorative medal of the Minister of Defence, 3rd grade – bronze to Col. (Ret.) Rudolf Novák, Col. (Ret.) Pavol Luspaj. Other 9 members of ZVSR were decorated by Commemorative medal of the 25th Anniversary of formation of the Armed Forces of the Slovak Republic. At the opportunity of the 25th Anniversary of formation of ZV SR there was also passed the highest award of the association – The Memory medal- Star of ZV SR to: Minister of Defense Peter Gajdoš, former Chief of General Staff of the Armed Forces of the Slovak Republic Gen. (Ret.) Milan Maxim, the Mayor of the town of Trenčín Richard Rybníček, President of ZV SR Lt. Col. (Ret.) Eugen Bitera, the Chairman of the Association Board Lt. Col. (Ret.) Mojmír Hloch, the Chairman of the Club of Generals Maj Gen. (Ret.) František Blanárik, the member of the Board of the Club of Generals Lt. Gen. (Ret.) Pavel Honzek, to former chairmen and presidents of ZV SR Lt. Col. (Ret.) Rudolf Otrísal, and to Col. (Ret.) Tomáš Švec and to the other 26 members from the particular clubs of ZV SR. The official part of the festive meeting was finished after carrying away the Guidon of ZV SR with military honors by the 2nd Vicepresident Col. (Ret.) Ján Paulech with thanks to all participants and inviting for the festive lunch. At the end of the festive meeting, the President of ZV SR reminded that the direction of the association after 25 years of it existence is clearly defined in the Focus Program of ZV SR approved during the 9th Congress of ZV SR in Trenčín in 2017. The given tasks will not be easy, they will need our stable unity, effort, understanding, tolerance and willingness to help each other. The author of this article is Lt. Col. (Ret.) Štefan Javorík, ZVSR, Slovakia. For more information, please contact ZV SR.